I was so excited! I had a baby sister! After having three brothers, I was really pleased to have a sister. A couple of days later Mum brought her home. My family and I were all so happy. However, my brother, George, hadn’t been feeling well for a while, so Mum took him to the doctors. They ran some tests and then further tests. Finally, results! 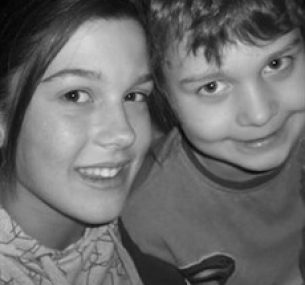 Eight days after Lizzie was born, George was diagnosed with leukaemia. I was only seven at the time and was very confused. One minute all my family were together – and then the next they were gone. My grandma was the only person left to question. She explained that George was very ill and needed treatment in Bristol and that Mum, Dad and Lizzie would have to stay away for a while. Meanwhile, my Grandma looked after me and my two other brothers, Ray and Jake, who were six and two at the time. Our Grandma looked after us for a few weeks, with my Mum and Dad on the other end of the phone. At last, we were allowed to see them! Grandma drove my brothers and I to our auntie and uncle’s house in Hemyock. Then they took us from there to Bristol. We were so happy to be reunited but, unfortunately, only for the day. That evening our auntie and uncle managed to drag us away to go home. Once again our family was ripped in half. 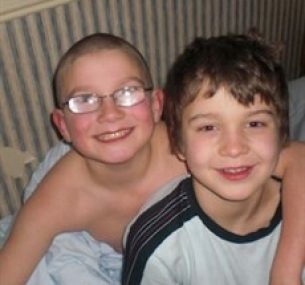 From then on we would spend our weekends up in Bristol and would stay the night at Clic House. Our Grandma continued to look after me and my brothers in the week but it could sometimes be quite a handful. So we would stay at different relatives’ houses. George had three years of chemotherapy. In that time he lost his hair. In 2005, he was put in remission. Everyone was so happy. My family and I went on a three week holiday to Scotland to celebrate. We could all finally lead a normal life. And so we did for about 18 months. Until George went for a regular check up and the doctors noticed that the cancer had returned. He was suffering a relapse. So once again George, Mum and Dad went back to Bristol Hospital. It felt like my family was falling apart by the minute. Grandma would look after me, Ray, Jake and Lizzie in the week. And then Dad would collect us after school on Friday’s to take us to Bristol and then would drive us home on Sunday evenings. That was what our lives were made up of, driving backwards and forwards. After a couple months they started chemotherapy again. He only just made it home for Christmas. George was so ill that Christmas. He had an ulcerated mouth and couldn’t eat anything. We decided it would be best for him to go back to hospital. So on Boxing Day morning I was woken up by Mum telling me to get packing because we were all going to Bristol. We set off with about a ton of leftovers in pots and pans in the boot! We stayed there until 29 December. Then all of us went home for New Year’s Day! George was too unwell to stay up on New Years Eve so we all went to bed like usual so it wouldn’t be unfair. But the next night he took a turn for the worse. He was too weak to move and his hips were giving him lots of pain. We had no choice but to phone for an ambulance. They laid him on a stretcher type chair and took him away. My mum went with him too. The next morning he woke up in Barnstaple Hospital after an operation on his hips. The reason his hips had been hurting so badly was because the chemotherapy wasn’t working and was just poisoning him. They had to get it out at once. George was then taken to Bristol Hospital in an ambulance with Mum and Dad. The doctor talked them through the options left available to George. They all agreed that the only option left was to have a bone marrow transplant. They checked the donor lists all around the UK but nothing came up. The most likely suitable match would be a sibling. Me, Ray, Jake and Lizzie had our blood taken, an experience I won’t forget! Its not often they give entonox (gas and air) just for a needle. But it was a waste of time. None of us matched. The doctors decided to look at the national donor board and eventually something came up. It was a British man who was living in South America. He flew over and donated. George and my parents were in isolation for about two months. The only contact we got with them was over the phone. Grandma found it difficult handling four children, so my mum’s sister came to help out. Grandma especially needed help with my brother Ray, who suffers from a condition called tuberous sclerosis. Ray found it really hard coping with what was going on and often had fits and ended up in hospital. Once we even found him in the morning unconscious after having a fit in his sleep. We had to phone for an ambulance. But soon everything was more settled. Then one day Dad came home and said we could see Mum the next day but only for the day. I was so thrilled I could barely sleep that night. I woke up early the next morning to get ready. It took about two hours until we arrived at the hospital. Obviously we were unable to go on the Bone Marrow Transplant (BMT) Unit. But we went up in the lift and waited in the corridor outside. We were all getting really impatient and suddenly the door opened and out walked Mum. We all rushed towards her and cuddled her with tears in our eyes. Dad left us to go stay with George. Mum took us to Sam’s House. It’s like Clic House but it’s especially for the BMT Unit, where relatives can stay. I missed Mum so much I found it hard to leave her alone. I wouldn’t let her go far. The day flew by and before I knew it, it was time to leave. I was really upset, I clung to my mum. Once I was in the car I couldn’t stop crying. I didn’t see them for another week or two. But one day Dad rang up and told us that George was out of isolation! The next day we all got permission for the day off school and went to visit him. He was really weak and much thinner. He had felt too ill to eat, so he hadn’t eaten for about two months. He seemed pleased to see us, though. George was in hospital for another month or two before he was let home. I was watching Friends one night and they walked through the door. Although he still had to go to Barnstaple Hospital every day, we were really glad to have him home. Since then we’ve had some ups and downs but somehow George always pulled through it. It’s now been over a year since his transplant and he is doing really well. We’ve been on another Scotland trip and have another one planned. George still goes for regular check-ups. But all in all he is well and with us. But who knows what the future will hold!